Cambridge Open Studios an organisation set up by local artists to promote the making of original works of art and craft and to provide an opportunity for the public to become involved in the arts by meeting artists in their studios. Artists and makers open their studios to the public in the weekends of July. A guide book is published in June listing the studios and galleries involved Guides are often available from the fruit shop and library… See www.camopenstudios.co.uk for more details. 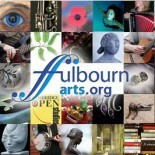 Click here to see some of the Open Studios Artists who have exhibited in the Fulbourn area in previous years. Paperweights, house names, sundials, memorials – any project needing stone with fine inscriptions. Calligraphy for special occasions. Working studio with finished bronzes and work in progress. Generally figurative work at one-third life size. Pictures and wallhangings. Scarves in indigo-dyed shibori – Japanese-style resist dyeing. Chiffon to shimmering velvets. Woodcuts and cyanotype cards. OneLinerImages are drawn with a continuous, single line, regularly indented to represent the structure of living cells and environmental interactions. My studio by the White Hart pub celebrates the natural world. A wide range of pictures – with plants, flowers and water being the main themes. Silence catches as you walk among fallen wings and stone, frozen faces drowned in ash echoing to the soundless hush that resonates within your dreams. Work inspired by the art and designs of ancient peoples. Statement pieces combine semi-precious gemstones, silver and copper. Uplifting, vibrant watercolours and inks, inspired by the beauty of flowers, nature and still life. Variety of original painted greetings cards. Showing at home studio this year. Wood sculpture, drawings and ceramic work, all exploring rhythm, the development of form, line and colour relations. Paintings, drawings and prints in watercolours, inks, pastels and acrylics. Texture and colour inspire my trees, flowers and landscapes. Easy parking.